It’s cold and flu season and it’s hitting pretty hard. 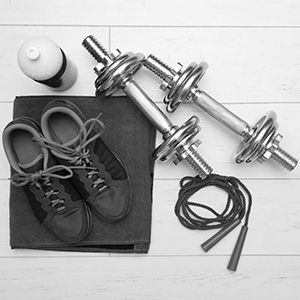 If you’re training at a gym or working with a personal trainer, don’t think twice about wiping the equipment down to prevent germs from spreading! But what happens if you do get sick? Is it wise to continue training, or should you wait it out? If you’ve been crushing it in the gym or seeing awesome results with your personal trainer, it can be discouraging to have to miss a day due to illness. So what should you do? Train or give your body rest? If you’re feeling sick or are sick, the most considerate and human thing to do would be to avoid the gym and your trainer to keep from infecting others with what you may have. If skipping out slightly terrifies you, keep in mind, healthy people experience less symptoms and recover faster from illness — so you’ll be back and at it in no time! If you feel like you have a cold, opt to workout at home or be extremely conscientious at the gym. This includes going at non-peak hours and sanitizing everywhere you’ve been. You can still train with a cold, just be mindful of your body. Consider reducing the amount of effort, time, reps, and sets you perform when you’re sick — just do less. For example, walk briskly for 10 to 20 minutes instead of running, or perform body weight squats instead of racking your normal weight. If you feel that your cold is turning into the flu and you have what are considered “below the neck” symptoms such as muscle aches or an upset stomach, do not consider working out. From here, you should focus on resting and giving your body time to recover. If you’re questioning a training session because you may be sick and you’re truly not trying to make an excuse, wait it out and rest. Contact us at Energy Fitness today about our personal trainers!